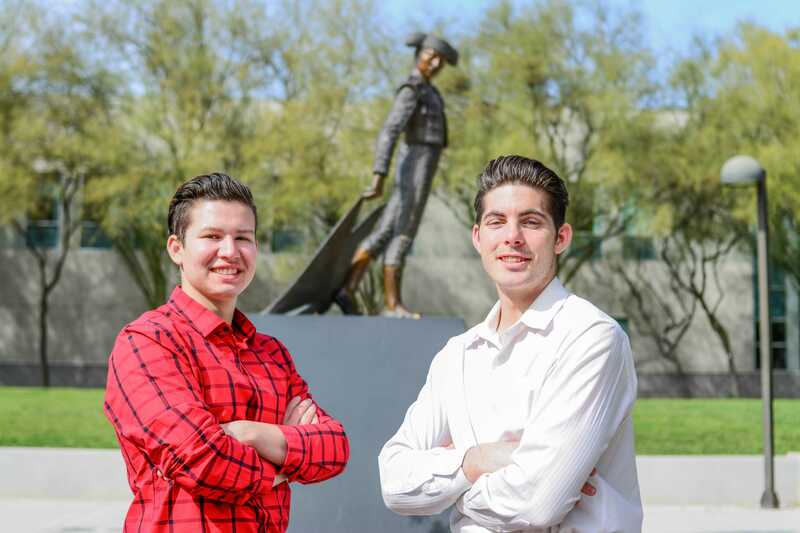 Business majors Osje Pena and Trevor McKnight are running for AS president and vice president on the Matadors For You ticket, hoping to represent all Matadors on the issues of safety, tuition, club funding, and student involvement. Pena’s quest for the presidency was spurred by a need he and McKnight saw in their fellow students for adequate representation. 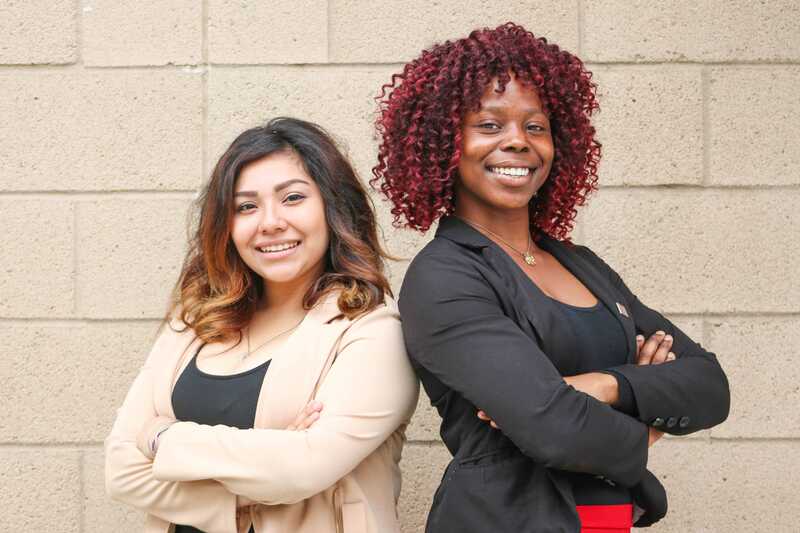 With harmonic visions for CSUN, Pena and McKnight decided the Presidential and VP roles were the best way to effect the changes they hope for. Pena and McKnight are no strangers to leadership roles with each having experience at high levels in the workplace and their respective organizations. Pena served as assistant general manager at a Del Taco restaurant for three years requiring team leadership and involved aspects of financial responsibility. McKnight served as manager at a Dickey’s Barbecue Pit in Santa Clarita and is currently serving his second term as vice president of the Sigma Phi Epsilon fraternity. Along with some friends, Pena helped start and served as director of finance for the non-profit The Young Voters National Front which aimed to improve voter turnouts by millennials in public elections, regardless of political affiliations. Pena helped oversee the organizational budget to ensure sustainability and effectiveness. Pena has established a political track record with his involvement in the protest of Executive Order 1100 alongside BSU, participated in the March For Our Lives demonstration alongside running mate McKnight, and has protested tuition hikes at every opportunity. “We are the anti-establishment candidate and we are not afraid to aggressively take the establishment down,” Pena said. 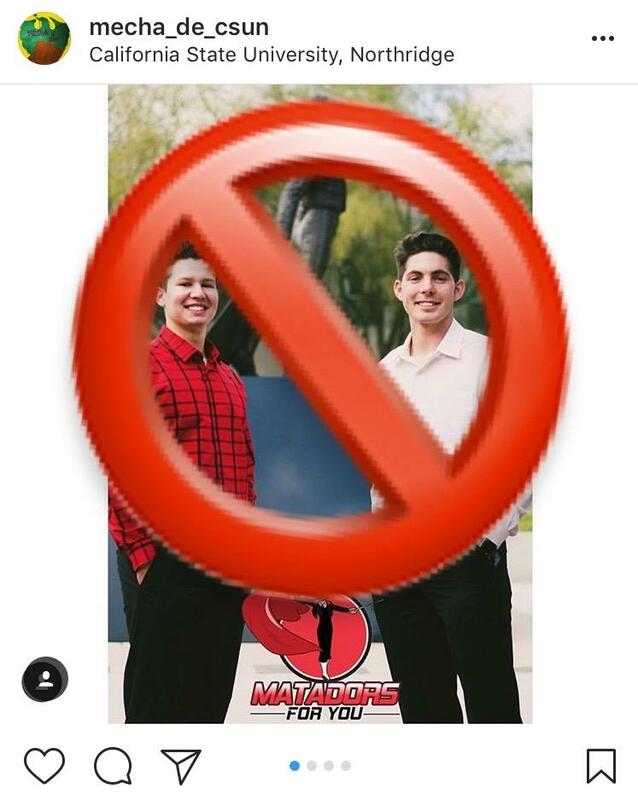 Some Matadors seem to have different ideas about Pena and McKnight. Several comments on an Instagram post from the CSUN chapter of M.E.Ch.A. 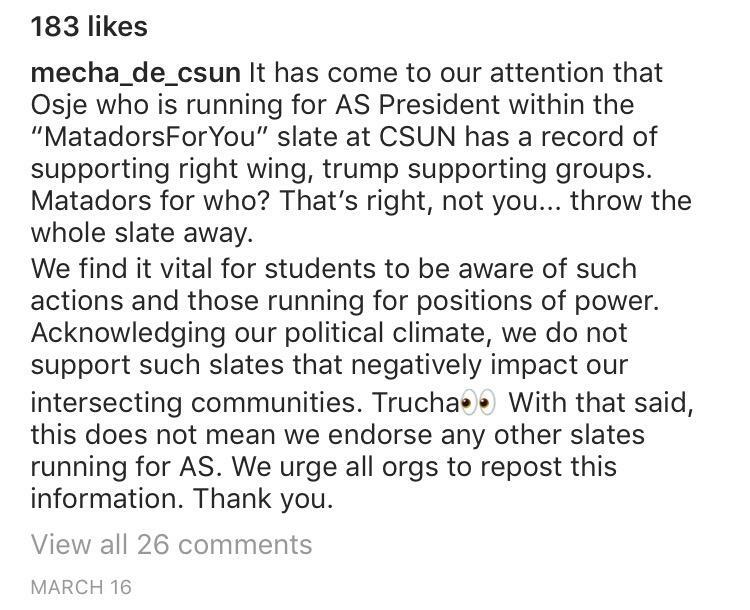 (@mecha_de_csun) label Peña as a right-wing Trump supporter and a negative impact on intersectional communities. Pena denied possessing conservative ideology, saying he is actually an Independent like his political role model, rapper Tupac Shakur. Pena explained that the rapper was constantly at odds with social elites, politicians, and other rappers because of the stances he took, something Pena always looked up to. “He definitely would have been the next major civil rights leader had he lived past the age of 25,” Pena said. McKnight claims to strive for success in the vein of Dr. Martin Luther King who he praised for being able to step out of his comfort zone in order to do what was right. “I truly wish I could have met the man and will be forever grateful for the movements he initiated and [which] are still being fought for to this day,” McKnight said. In further contrast to the social media attack, Pena explained he is a minority too coming from an immigrant family who moved to the U.S. from Honduras in the late 1980s to seek a better life. “As a fellow Latino, I strongly believe that all voices deserved to be heard, especially in marginalized communities,” Pena said. Despite the inherent politics associated with the elections, Pena and McKnight say their party platform is universal and aims to be inclusive of all students and their concerns. “I decided to run because I was tired of seeing empty words being said and I knew that I would actually act and make a change we can all believe in,” Pena said. “‘I’ve seen… female students talk about how sometimes they feel scared to walk around campus and I think that Osje wants to make a safer campus for us and to help decrease sexual assault. I think that’s a wonderful thing,” said Rose.